Le Curvy Kitten: Lady V London's new collection! Lady V London's new collection! So enthused was I on seeing Lady V London's new collection that I felt the need to write a post on them! Relatively new to them is the gorgeous Roxie Rocks dress, with 3/4 sleeved mock wrap top section and swing skirt, it's ideal for all those Christmas parties you're all thinking about at this time of the year. It comes in red with black trim, black with red trim, purple with white trim and teal with white trim. I will say that I've tried this dress (but unfortunately didn't photograph myself in it) and was really disappointed with the sizing ON ME. It was just too big in the shoulders, a problem I often have with dresses and shirts on account of my petite frame. Roxie Rocks costs £40 and comes in sizes 8-22 and is made from a luxurious stretch satin type fabric. Another new addition is the HD Swing Dress, which is the same as the previous range of swing dresses only it has the added detail of a contrast trim, which I'm a total sucker for! My favourite is the white with black polka dot, I'd wear it with red accessories as always. Priced at £45, the HD Swing Dress comes in a range of fabrics in sizes 8-22 and come with a matching headband too! Next up, the delicious Dolly Darling. In sizes 8-26/28 and 5 different colours with contrasting trim and waist bow, you can turn yourself into a 50's pin up for just £45! My personal favourite is the Cobalt Blue, it's so pretty! 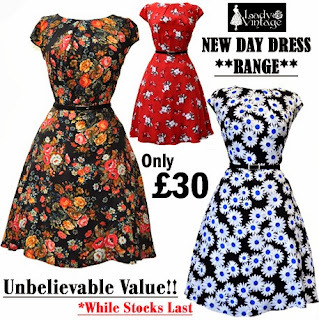 For those of you who prefer a less revealing neckline, how about Lady V's range of pretty Day Dresses? I LOVE the folded neckline and v-neck back. They cost just £30 and come in sizes 8-20 in a satisfying range of colours and prints. Saving the best until last, Behold the AMAZING Isabella Dress! Drooooool...Erm, yes, I'm a sucker for polka dots AND red AND bows, and this particular dress has it all! 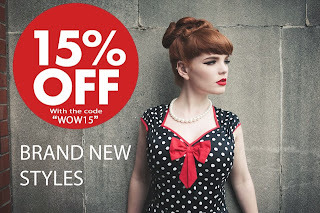 It's sweetheart neckline and swing skirt are very similar to another favourite of mine, the Pinup Girl Clothing Heidi, so it's nice to have a cheaper alternative. 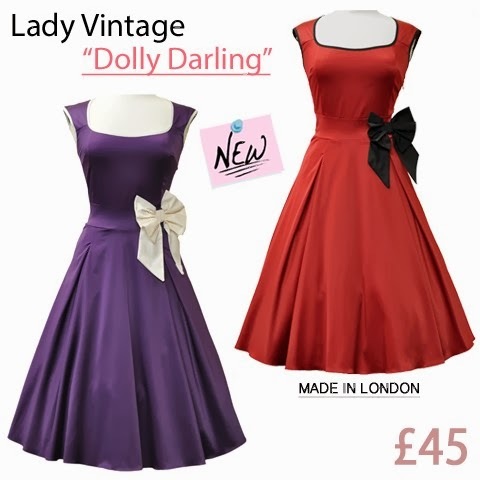 Isabella is offered with 1/2 sleeves in purple (below), blue and black, and cap sleeves in Mocha polka dot, black with pink trim and black/white polka dot with red trim, comes in sizes 8-20/22 and costs £40. My only bugbear is that looking at the measurements, none of the Lady V dresses will fit me without alteration as the waist measurements generally come up between 1 and 3 inches bigger than my own. For this I'm GUTTED, but still very tempted to get this Isabella and have it altered. For a limited time only (and I have no idea how long the offer is on) you can get a generous 15% off your entire order with Lady V London using the discount code WOW15 at checkout. GO! 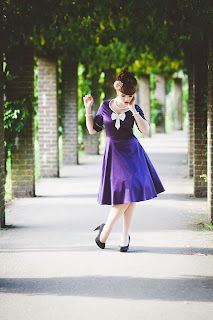 The Lady V London HD Swing dresses (with matching headbands) look fabulous! Just looking at them makes me wish I'd had more dance lessons - they look like such fun to wear! 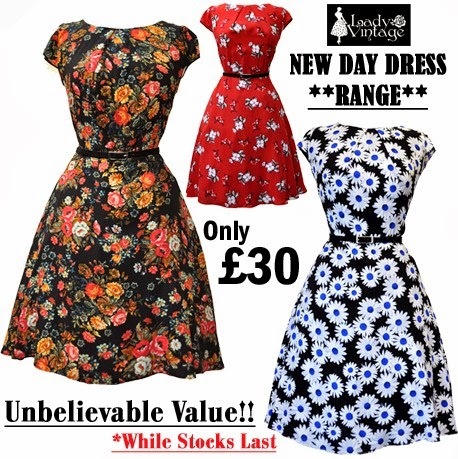 I'm partial to the floral prints but all of the Lady V London dresses look pretty. You must look spectacular in them when you can find one that fits or is tailored to fit your beautiful figure!